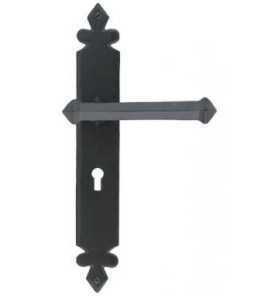 The From the Anvil range has become internationally reknowned for its' unique interpretation of period ironmongery. Items are hand-forged using traditional English blacksmithing techniques to give each piece an individual character rarely seen in these days of mass production. We have chosen the Traditional Black finish for the products in our collection. This is a powder coated application which gives a much longer lasting finish than standard paint or wax finishes. 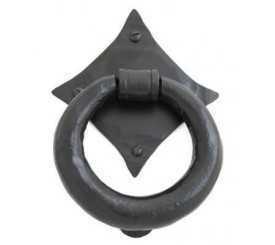 Description: Beautiful hand forged ring door knocker. Suitable for heavy doors. Comes complete with striking stud. Sizes: 110mm diameter ring, 80mm square backplate. Sizes: 102mm wide ring, 63mm diameter backplate. Fixings: Supplied with 1/4" threaded bolts to fix from rear. 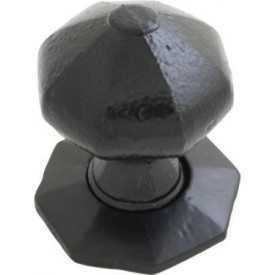 Sizes: 323 x 108mm overall, 254 x 50mm aperture, 290mm bolt centres. 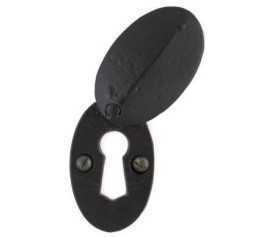 Description: Covered escutcheon for mortice locks. 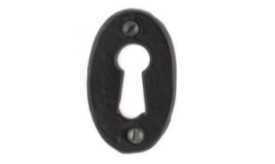 Description: Escutcheon for mortice locks. 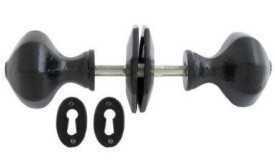 Description: Unsprung knobs for use with mortice and rim locks. Threaded spindle allows adjustment for various door thicknesses. Sold as set of 2 knobs with 2 open escutcheons. Fixings: Supplied with threaded spindle and fixing screws. 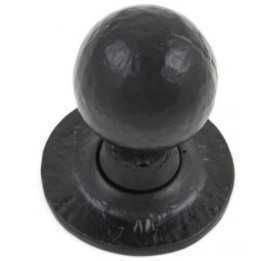 Sizes: 57mm knob, 67mm rose. Sizes: 45mm knob, 63mm rose. 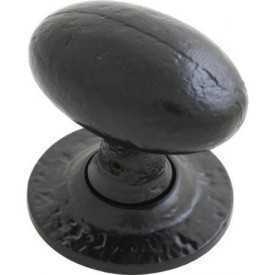 Sizes: 64 x 38mm knob, 63mm rose. Description: Unsprung, handmade lever handles. 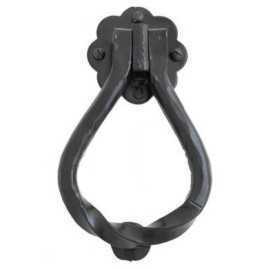 Description: Traditional design of thumblatch with staple and keep. Decorated bar. 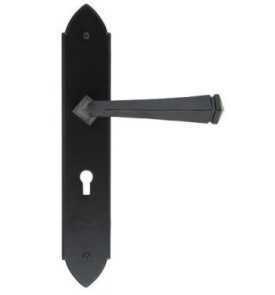 Sizes: 216 mm handle, 191mm latch bar. 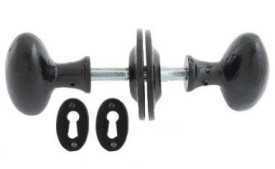 Description: For use on inward opening doors with tempered back spring. 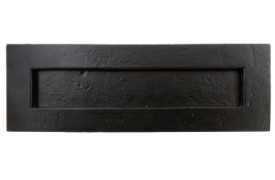 Sizes: 165mm bolt, 152 x 51mm fixing plate. 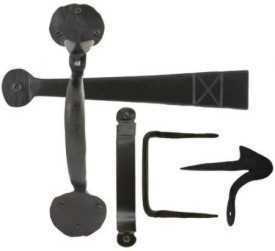 Description: For use on outward opening doors with tempered back spring. 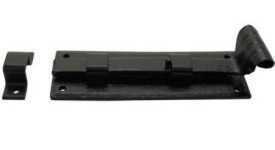 Sizes: 178mm bolt, 152 x 51mm fixing plate.